The Mid Atlantic region, which includes New York, New Jersey, Delaware, Maryland, Virginia, and North Carolina, is an important supplier of American seafood. 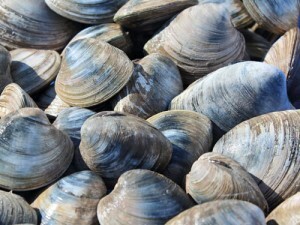 The states of New York and New Jersey are famous for quahog clams, ocean clams, surf clams, soft shell clams, scallops, lobsters, and several species of saltwater fish. These include several types of groundfish such as cod, haddock, pollock, hake, whiting, bluefish, yellowtail flounder, winter flounder, fluke, scup, and others. Delaware is known mainly for its shellfish from the Delaware Bay, including crabs, oysters, and clams. Maryland is best known for its Chesapeake Bay seafood, including blue crabs, oysters, striped bass, and other products. Ocean City, the state’s only sea port is home to a variety of ocean going vessels fish. Boats returning from the open Atlantic land swordfish, tuna, wahoo, mahi-mahi, sharks, black sea bass, croaker, spot, weakfish, bluefish, flounder, monkfish, dogfish, striped bass, and other fish. Shellfish from the deep waters of the Atlantic are also landed in Ocean City, especially sea scallops, surf clams and lobsters. Maryland’s coastal bays produce blue crabs, hard clams, and saltwater fish. Also important are aquaculture operations, which produce farmed clams and oysters. Virginia is the mid-Atlantic’s largest seafood producer, with several valuable types of fish and shellfish. The most valuable harvest by far comes from sea scallops, a shellfish that places Virginia among the top Atlantic states for both value and volume of seafood landings. Blue crabs are another important component of Virginia’s seafood industry. Virginia has considerable harvests of both wild and farmed oysters and clams. From the Atlantic Ocean, Virginia fishermen harvest lobsters, black sea bass, flounder, croaker, spot, monkfish, dogfish, striped bass, and other species. North Carolina is another major source of Mid-Atlantic seafood. Commercial fishing boats from this state fish the open Atlantic, Albemarle and Pamlico sounds, and other inshore estuaries. Landings of blue crabs are typically the largest of all the seafood in North Carolina, followed by croaker, flounder, and shrimp. Additional landings include clams, oysters, king mackerel, snapper, grouper, sea bass, tuna, and other seafood.